Pachi Pulusu: Pachi Pulusu is an unheated version of the pulusu, a type of curry-like stew from Telangana. 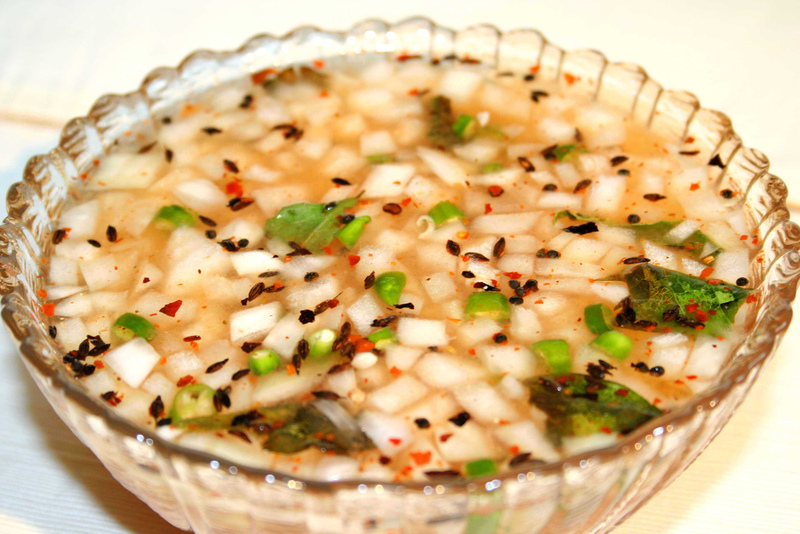 Unlike regular pulusu, pachi pulusu is much more spicy, watery and light. Typically pachi pulusu is prepared with tamarind, onions, chillies, and jaggery. Other typical Telangana seasonings may be added, such as coriander, curry tree leaf, or garlic. In the summer when mangoes are abundant, tamarind is replaced by stewed raw mango. Soak the tamarind in 5 cups water. Mix the tamarind in the water to extract the flavour and throw the pulp/remains of the tamarind. Add in red chilli powder, salt and chopped onions. Sprinkle coriander leaves on top of the tamarind mixture. Add in the mustard seeds, cumin seeds, curry leaves and broken red chillies. Fry till the curly leaves are crisp and starts turning golden brown. Add in the turmeric powder. Take off from heat immediately, after adding the turmeric. Add to the tamarind mixture. Pachi pulusu is ready to be served. Serve pachi pulusu with hot steaming white rice. If you have any queries regarding the Pachi Pulusu recipe, please leave a comment.